Both can range from cheap and cheerful to high-end and luxurious, and both are a matter of taste. But despite the similarities between the two industries, are whisky and fashion collaborations a worthwhile experiment, or just a marketing gimmick? Matt Evans looks at why the two worlds are beginning to overlap. You might be forgiven for believing this quote is about whisky, but clothing designer Kestin Hare is actually talking about fashion. The whisky and sartorial worlds share so much DNA – themes of luxury and exclusivity, a move towards sustainability and the rise of limited edition culture – that we’re beginning to see more interaction between the two sectors. As worlds collide, small-scale collaborations are becoming the de facto way that whisky and fashion names interact. Hare was speaking last month at his eponymous Shoreditch store, at the launch of his new Spring/Summer menswear line aptly titled: ‘Summer in Speyside’. The line has been created in collaboration with Speyside distillery BenRiach, but rather than just slapping a logo on the lapel, whisky has been used as inspiration for the style, materials and colours of the collection. The coats, for example, are made in the style of the ‘shop coats’ once worn on distillery floors and have been traditionally garment-dyed – the finished garment is dyed, rather than being constructed from pre-dyed fabrics – to match the amber hues of BenRiach’s 10-year-old Curiositas and the darker, richer brown of the 21-year-old expressions. 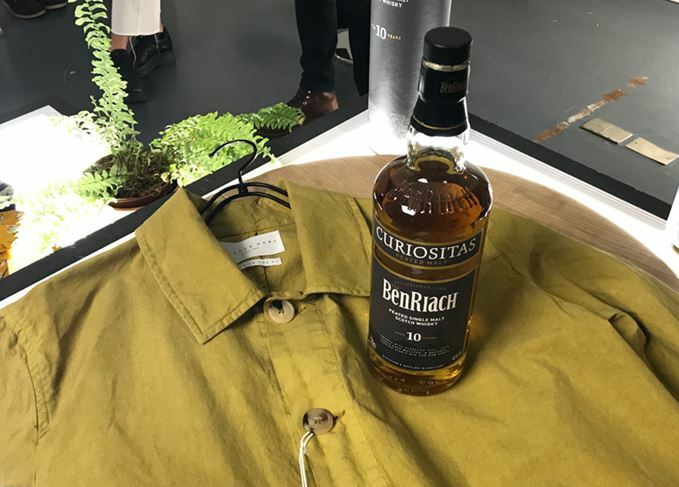 BenRiach is the latest whisky producer waking up to the possibilities of partnering with the fashion industry. Jack Daniel’s has been a lifestyle brand for years, its trademark black label emblazoned on clothes, accessories and even Harley Davidsons. The whiskey has been firmly cemented as a piece of pure Americana. Spirits giant and Johnnie Walker owner Diageo has also made forays into fashion in the past, enlisting luxury shoemaker Oliver Sweeney to produce two limited edition whisky-themed shoes for men. The Johnnie Brogue in 2014 was a smart shoe with a ‘hidden’ compartment to store a Red Label miniature in the heel, limited to just 130 pairs. A run of 200 pairs of Talisker hiking boots followed in 2017 – rugged and very much in line with Talisker’s ‘Made by the Sea’ adventuring ethos, the boot came complete with a miniature hip flask clipped into the left shoe. While Diageo and BenRiach have stuck to menswear, Macallan’s South African marketing arm is embracing a fashion-conscious female consumer. The whisky brand shot a campaign with Instagram fashion influencer Kefilwe Mabote last year, naming her its ‘Master of Couture’. Wearing a gossamer dress from South African luxury brand Quitera & George, Mabote floats around the mansion tearoom set with her dram in ‘a celebration of femininity, fashion and fine spirit’. There’s no product to tie the two together here: the partnership is more of a spokesperson arrangement than a collaboration. However, this is not the distillery’s only foray into luxury fashion; in 2017 it partnered with perfumist Roja Dove on the creation of its Edition No. 3 expression and, separately but in the same year, watchmaker Urwerk on a novel, micro-engineered hip flask, which retailed for US$2,000. The flask contains 156 components, including a pop-out stand, the option to flick between two separate whiskies with one mouthpiece and dials to label the whiskies. It represents a different kind of fashion collaboration: rather than whisky brands appearing on clothes, fashion brands are also making products for the whisky sphere. This is not an isolated incident – luxury leather designer Bill Amberg created unique cases for Yamazaki’s 18 and 25-year-old expressions, while Highland single malt anCnoc partnered with Scottish fashion designer Patrick Grant to create the packaging for its limited edition expression Blas, Gaelic for ‘taste’ – a word which applies to both fashion and whisky in equal measure. Fast fashion – the practice of buying cheap items of clothing which wear out quickly – could soon be on the wane as producers get increasingly conscious about the ethical responsibility, and good PR, that comes with offering sustainable products. M&S, H&M and Japanese high street retailer Uniqlo already offer clothing take-back schemes, providing the option to recycle old clothes at some of their stores. The UK government has backed a ‘sustainable clothing action plan’, committing Next, M&S, Ted Baker, ASOS, Tesco and more retailers to reducing landfill waste and carbon emissions by 15% by 2020. As the sustainability trend rises, the ‘buy less, buy better’ mentality is likely to become as common in clothing as it is in drinks. As a result, the fashion industry is after an ethical story to tell. With his brother Ryan, Belchan began making watches using wood from whiskey and beer casks. The brothers then use a portion of the profits to plant trees as part of the company’s Forest Garden programme, which helps to farm and feed Senegalese villages. In the eyes of the Belchans, whisky wood tells a story about ethical production, recycling used casks in a cool new way. The idea was certainly good enough for Jim Beam, which approached the brothers at a trade show to discuss a collaboration – a run of 500 Jim Beam Black x Original Grain watches. We only have to look at the bottle flippers circling anticipated releases like this year’s Game of Thrones bottlings to know the whisky industry is also employing this strategy. Limited editions drive up prices and ensure constant demand for new product, whether it’s a sneaker or a Sherry cask finish. Some fashion brands like Supreme only produce limited editions, making every new product launch an event. It’s that small batch, experimental mindset coming to the fore once again. The marketing for Original Grain’s Jim Beam watch operated on the same lines as Hare’s earlier comments on the history behind products. ‘Every barrel has its own story,’ drawls the voiceover on the collaboration’s advert, as images of Jim Beam barrels play over bluesy guitar. ‘This is our salute to American heritage’. Story and heritage are recurring themes in all these collaborations, as it seems weaving a distillery’s long history into a fashion brand provides inspiration for designers and a ready-made story for marketing. Beyond simply getting brands in front of new audiences, whisky and fashion collaborations are generating unique products which aim to cement whisky’s place as a lifestyle, rather than a drink. Wear BenRiach, tell the time with Jim Beam and sniff perfume-accented Macallan from a micro-engineered hip-flask. It’s all marketing really. But what is good marketing if not good storytelling? The Scotch brand has created a bespoke line of sunglasses fashioned out of used whisky casks. The fine art of redesigning your product has to balance innovation with respect for heritage.